In January of this year, I decided to conduct an experiment on Twitter. I was partly inspired by the Kevin Ashton article: How to become internet famous for $68 and many reports that celebrities had huge fake Twitter and Facebook followings. No one seems to care that they do, although there are dozens of articles “exposing” the whole thing. I found it intriguing that people could actually purchase Twitter followers, Facebook Likes, positive reviews, and retweets. Social Media has sparked all these new markets and I was curious to get the inside story. My own experiment’s goal was twofold: First, to find out what the real story is on purchasing Twitter followers (because I wasn’t convinced that you could do so) and second, to experiment with purchasing them with Bitcoin. The results of the experiment are interesting, but not nearly as interesting as the Twitterati* itself. Excerpt from Kevin Ashton’s article: How to become internet famous for $68. “On social media, it is easy to mistake popularity for credibility, and that is exactly what the fakers are hoping for. To most people, a Twitter account with tens of thousands of followers is an easy-to-read indication of personal success and good reputation, a little like hundreds of good reviews on Yelp or a long line outside a restaurant. Looking online to learn more about somebody has become a reflex—blind daters do it, potential employers do it, potential customers do it. On Twitter, it’s all about how many followers you have. It’s also about what you tweet to your followers. The theory is that you’re supposed to carry on 140 character conversations with your followers and fellow tweeters for entertainment and edification. Everything works in theory, doesn’t it? Twitter has become one of those forums where speakers (tweeters) want to speak but not listen. It’s much the same as in any other forum, digital or physical. I’ve found that Twitter has very little to offer outside of reading marketing bytes, automated tweets, or rancid dialog from those who disagree with what I’ve stated in an article or in a post. Occasionally, there are those who carry on a constructive dialog, but they are very few and far between. Some tweeters simply tweet just to tweet. It’s analogous to hearing your own voice. It’s both self-medicating and self-satisfying. And perhaps the most entertaining of all is those who hide behind cryptic pseudonyms. They wish to remain anonymous because they want to tweet things that they’d never say in person. Refer again to my earlier digital graffiti reference. I researched the process and decided to try it for myself to see what happens when one purchases Twitter followers and to see if it was truly a scam or not. Spoiler Alert: You can purchase Twitter followers but you might not want to because a lot of them are fake. I began my quest on January 8 with my own, organically grown 2,761 Twitter followers. I started out by purchasing a batch of 5,250 followers who were guaranteed to be real. So my goal from that purchase was 8,011 followers. It took a couple of days for the “delivery” but it finally happened. As if by Internet magic, 5,000 or so followers were now in my tank. I had more than the promised 5,250 followers. The reason is that when Twitter finds fake followers, it deletes them. I’m sure it’s done by some automated algorithm that scans the site for “Eggs” and user accounts that have never tweeted at all. I was so excited by this, that I had to try again. This time, I went for a whopping 5,550+ followers for just $5. What a bargain. Sure enough, in about a day, I had another 5,000+ followers. Unfortunately, while waiting my total had gone down to 12,959 by January 11. By January 13, it was 12,823 and by January 15 my band of loyal followers had dropped to 12,730. 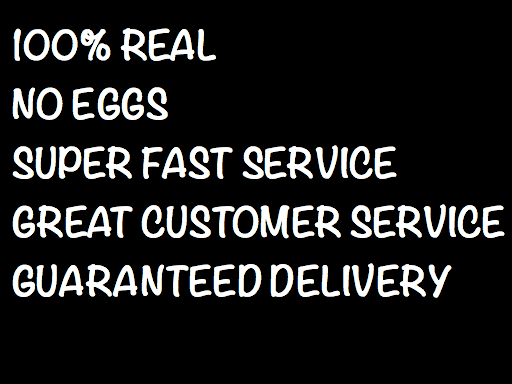 The 5,500+ followers were advertised as: 100% Real, No Egg Emage (Image, I assume), Fast Delivery, Full Customer Support. It was fast, for sure. In just a day, I had 5,000 more followers to my name. And I didn’t have to setup automated tweets or battle it out with the Twitterati to get them. Such a deal at only $5. I thought to myself, “Wow, this is easy and cheap. I’ll just keep doing it.” I ordered up another ‘3,000 Real Active Twitter Followers in just 12 hours.’ Yep, just as advertised, by January 16, I now had 15,983 followers. By the 17th, I had 15,931. I stopped counting on January 20th at 15,604. I then tested my numbers at: http://www.twitteraudit.com. To my surprise, I found that roughly half of my ‘Real’ followers were in fact fake. You can only imagine my reaction to this. I kept watching my total number of followers go down every day, sometimes by more than 100 followers. I was devastated. To think that I paid good Bitcoin for those followers and half (or more) were fake. Just out of curiosity, I checked the following accounts for fakes to see how I fared in the fake Twitter follower realm. So, a full month after purchasing all those Twitter followers on February 17, I had 14.8K followers. I purchased another 3,000 from one of the people I’d purchased from before to see if she had another 3,000 100% Real followers to send my way. Sure enough, she did. She said my target follows would be 17.8K. In about a day, I had just over 18K followers. They always give you more because, as I explained earlier, the blatantly fake ones get deleted. As it stands now, two months after my original purchase, I have 17.4K followers. According to twitteraudit.com, I have 50% fake, which would give me 8,600+ real followers. According to another auditing tool (http://fakers.statuspeople.com), 63% are fake, 24% are inactive, and a whole 13% are real. Calculating just the real from my current number of 17.4K, that leaves me with a total of 2,262 real followers. But wait. I started with 2,761 organically cultivated followers. And now, I have as few as 2,262? What’s up with that? One can argue that some of my original ones were fake, maybe a few dropped out, or maybe something is wrong with the algorithms to calculate the totals. Another tool at: http://www.socialbakers.com/twitter/fakefollowercheck tells me that I have 25% fake or suspicious, 0% inactive, and 75% good. So, who knows for sure? I really don’t like Bitcoin or bitcoin or however it’s supposed to be written. Sorry, the proper terminology for it goes into the “Who Cares” bin. However, for my test, it was the perfect solution. I could purchase something fake, or potentially fake, with something that is borderline illegal. But that’s another story. For the purpose of this post, I’m going to focus on my purchases with Bitcoin. Remember that standard gigs on fiverr.com are $5. You see, each time you buy something with Bitcoin, the amount changes because the “value” of Bitcoin constantly changes. Unfortunately, not always in your favor, as you can see by mine. There is also a small fee for carrying out the transaction. I’m not sure how much it is in Dollars or Bitcoins because I didn’t pay a lot of attention. The problem is that if you use Dollars to pay for something and the amount is $5, you pay $5 on whatever day it is. Not so with Bitcoin. As you can see, I paid three different amounts of Bitcoin each time, although the value of the transaction was $5. Well, $5 in Dollars, that is. This is one of the strongest arguments against Bitcoin. You don’t really know how much you’re paying because the value fluctuates so much, so often that you can’t track it and there’s not a single exchange value for Bitcoin. So, your favorite exchange might value Bitcoin at $500, while another exchange values it at $450. One day you might barely be able to buy lunch with a certain amount of Bitcoin and the next day you could buy the restaurant with that same amount. Weird, huh? I still don’t see the point of using it for transactions because of that point. There are many others, but again, that’s another story. The jury (literally) is still out on Bitcoin. If I were a betting man, I’d say that the Federal Government or InterPol will shut down all Bitcoin and other cryptocurrency transactions in the near future. And if you think that Silk Road and Mt Gox left people feeling the pain, just wait until Uncle Sam decides that Bitcoin is not only shady but illegal. You might believe that purchasing Twitter followers has left me with a less than enthusiastic endorsement of the practice, but it hasn’t. I think that growing your following organically is the best thing to do. It’s the most honest thing to do, for sure. But hiring “shills” is nothing new to the business scene. It’s actually a very old practice. People, by their very nature, are crowd followers. If you see that someone only has 100 followers, you’re not as likely to follow as you are if that same person has 150K followers. It’s just the way we’re made. Do I believe that everyone I’ve listed in the examples above have “plumped” their following with purchased or fake followers? Certainly not. The fact is that anyone can buy followers for any account. If I wanted to, I could purchase 5,000 followers for a Twitter account other than my own. That part might surprise you. If you don’t believe me, I’ll buy someone, maybe you, 5,000 Twitter followers. There’s not much you can do about it. You can buy a subscription to a service that will delete them. But what if they’re wrong? What if they delete real ones that are simply inactive? It’s a dilemma, for sure. Unlike Kevin Ashton, and who knows who else, I only spent $20 to test this idea of purchased fame. I think the $20 was well spent. It gave me fodder for this post and a bit of entertainment as well. Can’t go to a movie and buy a Coke and popcorn for $20. Do I think it’s a good practice to buy Twitter followers or Facebook Likes or any other form of fake fame? No, I don’t. It’s kind of silly, really. But, I wonder, is it really all that different than having a Publicist strategize a “chance” photo shoot of a celebrity doing something in public? Is it all that different than running a commercial on TV or sending out a Press Release? Or filming a music video where the artists lip sync while thousands of screaming fans look on? I think the best practice is to grow your audience, attract your Facebook Likes, acquire multi-star ratings on Amazon, and gather +1s on Google+ by doing something well. That seems to be good advice. However, in the grand scheme of things, who really cares how many Twitter followers someone has, fake or otherwise? I really don’t care. If you’d have told someone, even you, 20 years ago about Twitter, you’d have laughed a part of your anatomy off. It’s really a silly thing. Social networks in general are silly. Facebook is silly, Twitter is silly, and so on. LinkedIn is pretty good because it’s professional and you can actually measure its value but it’s the exception. So many people use bots and automated tweeter software that everyone is tweeting but not that many people are reading. Twitter users tweet about everything and they expect that someone is reading their stuff but it really just goes into the electronic aethers to compete with all the other bots and automated quips, fluff, and “sage” advice. This was an experiment for me. The greatest lesson that I’ve personally learned from it is that Twitter, Twitter followers, Facebook Likes, and Bitcoin only have value if you give them value–or if “everyone else” gives them value and you join in. On their own, they have none. Now, how much will it cost me to get rid of the fake Twitter followers? Adding followers is easier than getting rid of them. There are services that want to charge you to do this but I think I’ll just wait it out and let Twitter Darwinism take effect. There is a person on fiverr.com, oddly enough, who’ll remove 500 fake followers for $5. So, it costs $20 to buy 15K followers and $150 to remove them. Not a chance. *People who use Twitter, often as their own platform. Think digital graffiti artists. **fiverr.com supports sellers of all kinds of “gigs” as they call them. From voiceovers to art to music and, of course, Twitter followers. The site is legitimate and most of the sellers are as well.